I started WeightWatchers again last week. As in, I'm going to the meetings and everything. It feels good to have some control over the food I eat. We'll see how it goes, but I'm feeling positive. My downfall on the weight loss journey is snacking in the evening. I hate the thought of my dinner being the last thing I have, I feel cheated unless I get to have a little something in front of the tv afterwards. WeightWatchers allows me such flexibility - I can save some points for the evening if I want to. So aside from the regular snacks - popcorn, a piece of chocolate, fruit - I've taken an interest in healthy desserts. I'm sure there must be loads of ideas out there and I'm trying to find the ones that would work for me. Because swirling some fruit into greek yogurt really doesn't do it for me, even for breakfast. What's your favorite healthy dessert? 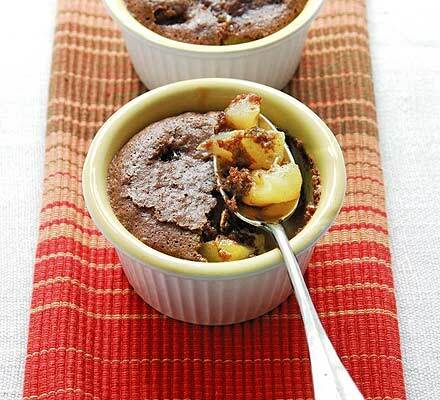 This weekend, I tried this recipe for a chocolate pear crisp. Except that I made it with apples and rhubarb so I guess it should be called something else. The original pear recipe is by Mary Cadogan and comes from BBC Good Food Magazine. You can see it online here. I forgot to take a photo before we ate them, so I've used the one from BBC Good Food Online. Put the apples in a pan with the lemon juice and the sugar. Add a bit of water so that the mixture doesn't stick to the pan when heated. Bring to the boil, then cover and cook for 10 minutes. Uncover, then cook for 8-10 minutes more until the juices thicken up. Spoon into 4 ramekins. Add a couple of tablespoons of rhubarb into each ramekin, if using. For the topping, sift the icing sugar and cocoa into a bowl, then stir in the almonds. 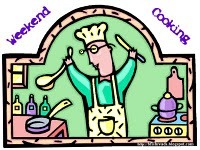 Whisk the egg white until stiff, then fold in the dry ingredients. Spoon over the pears and shake the ramekins so the mixture evens out. Bake for 20-25 minutes until the topping is firm to the touch. Serve warm or cold. I like any kind of fruit dessert. I like to make fruit salad, and that usually serves as dessert. Boring, I know, but it works for us. Ooh, I definitely want to try it with apple and rhubarb too! Love the combination. I love rhubarb! Can't wait for it to be in season--soon! I lost a lot of weight two years ago [and kept it off!] counting calories using the LoseIt app on my iphone so I totally understand being really careful throughout the day just to have 50-100 calories to use on something sweet in the evening! When my calories were really tight, I would treat myself with fresh berries and whipped cream. If I was lucky, I'd even have enough calories left to crumble a small cookie over it all! This dessert looks great! I NEVER would have thought it was Weight Watchers approved. Its like you can literally have your cake and eat it too! someone just mentioned apple rhubarb being their favorite dessert but I've only ever had rhubarb with strawberry (not even sure where to find rhubarb at the grocery). Bet it would be yummy! PS--does anyone know where that "Subscribe to Comments" button when? !